Threaded feet for simple height adjustment and levelling. Units can be placed side-by-side, to provide a large working area. EN-14183 compliant and GS approved. Mild steel construction with epoxy powder coated grey finish. Galvanised 50 x 38mm mesh grid, or slip resistant phenolic platform. 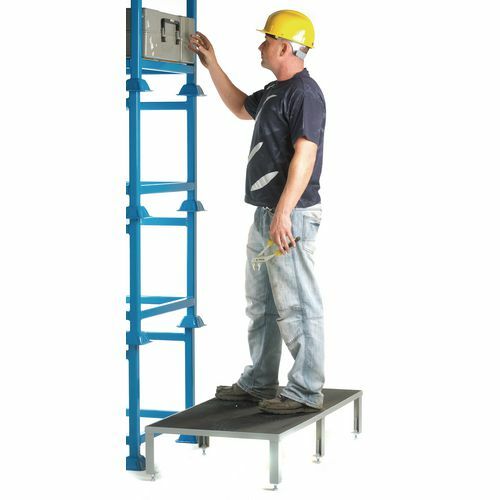 If you need a simple way to access mid-level heights our adjustable steel work platforms are perfect for you. Available with two types of tread material, ribbed rubber tread and galvanised mesh grid. They also come in a range of platform lengths, 610, 910, 1210 and 1510mm with a choice of two adjustable heights 140-210mm and 230-300mm. The units can be placed alongside each other to provide a large working area, conveniently allowing more than one person to work at higher than ground level at the same time and giving a larger area to work across. Made of a mild steel construction these platforms are adjustable in height by turning the threaded feet to enable you to complete tasks at different levels above ground. They're finished with epoxy powder coated grey and are approved to European GS (Geprüfte Sicherheit ("Tested Safety") Standard - they have a 12 month guarantee and FREE Delivery.